Of the many types of coffee in Indonesia, Aceh Coffee is one of the most attractive belle. Not only in Indonesia, Aceh coffee has been known to overseas. Aceh is one of the largest coffee producer in Indonesia. This type of coffee grown in the region of Aceh is a type of coffee robusta and arabica. Of these two species, Arabica is considered to have the best quality. 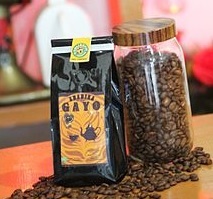 Arabica coffee from the Gayo even crowned the world’s best organic coffee. This kind of coffee has a distinctive flavor to the main feature, among others, aroma and complex Flavor and a strong viscosity. No wonder a lot of demand for exports from other countries, especially countries of the European continent. Research from the National Institutes of Health and the AARP found that people who enjoy coffee every day had lower levels of depression than those who did not consume coffee at all. Not only avoid depression, consumption of coffee can improve mood . Responsible for the content of this case is the content of antioxidants and caffeine owned coffee. Many studies have shown that caffeine in coffee can help the regulation of the heart. Recent research has found that regular coffee consumption every day can lower the risk of disease autiomun sclerosingcholangitis (PSC) which can lead to liver cirrhosis, liver failure and even cancer. Other studies have also found that alcoholics who consume coffee lower the risk of alcoholic cirrhosis compared to alcoholics who do not consume coffee. It’s no secret that caffeine in coffee can increase the vigor and stamina. Because this content, coffee can serve as a natural stamina drinks. Try drinking a cup of coffee before a presentation or exam. Science Daily magazine revealed that consumption of 4 small cups of coffee a day may lower the risk of type II diabetes by 25%. This is thanks to the content of the chlorogenic acids and alkaloids that can reduce the absorption of glucose in the body. Coffee helps memory and thinking remained sharp. Many studies have suggested that coffee drinkers average had 60% lower risk for developing Alzheimer’s disease and dementia. Other studies prove Parkinson’s disease can be prevented and the risk is decreased from 32% – 60%. It karea protein decreases the production of protein beta-amyloid , which usually accumulates in the brain of Alzheimer’s sufferers. Coffee other than as a mood booster, stamina and morale are also useful to prevent skin cancer. The study by Brigham and Women’s Hospital and Harvard Medical School in 2012 found that women who konsumsi 3 small cups of coffee a day can prevent skin cancer than women who did not drink coffee or drink low-caffeine coffee.